HBO’s first big drama series for 2014 begins in less than two week’s time. 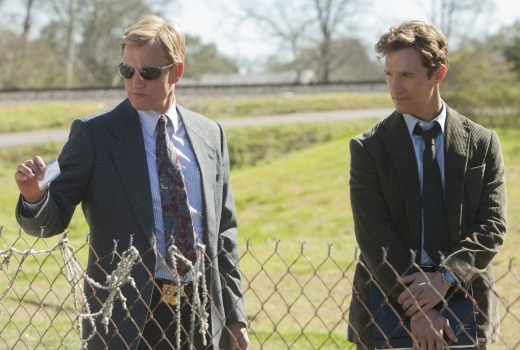 True Detective stars Woody Harrelson and Matthew McConaughey as detectives hunting for a serial killer in Louisiana across seventeen years. This series created by novelist and screenwriter Nic Pizzolatto includes multiple timelines. It will be fastracked by Showcase on Monday week. Written and created by Nic Pizzolatto (‘The Killing’) and directed by Cary Fukunaga (‘Sin Nombre,’ ‘Jane Eyre’), ‘True Detective’ stars Woody Harrelson as Martin Hart and Matthew McConaughey as Rust Cohle. The series also stars Michelle Monaghan (‘Mission: Impossible III’) as Maggie, Hart’s wife; Kevin Dunn (‘Veep’) as Major Quesada, the supervising officer in 1995; and Tory Kittles (‘Sons of Anarchy’) and Michael Potts (‘The Wire’) as Dets. Papania and Gilbough, the investigators now probing Hart and Cohle for answers. 6:30pm Monday 13 January advance screening (premiere 8:30pm Tuesday January 14). Who’s the Chris Isaak lookalike? Awesome thanks for the heads up. Great news, really looking forward to this. David, any news on Foxtel fast tracking Looking?